With Nov. 11 Remembrance Day ceremonies fast approaching, the Reporter asked Gordon Burr of the University Archives to share his Point of View with the McGill community. Burr has selected one story of a former McGill student from the War Records to help us reflect on war and remembrance. I have been an archivist in the McGill University Archives (MUA) for a number of years. The main task of archivists is to preserve and make available archival records entrusted to their care. Some of the most important records in the MUA are those created during the Second World War by the War Records office. This office was established by Principal and Vice-Chancellor F. Cyril James to track the activities of McGill staff, students and alumni during the war. These 9,000-plus records, accumulated by Robert Collier Featherstonhaugh, are on paper and in the past had to be consulted in the MUA reading room. Now, thanks to the generosity of McGill alumni and longstanding friends John and Pattie Cleghorn and the support of Principal Heather Munroe-Blum, through the McGill Remembers Project, the McGill University Archives is undertaking the digitization of these records to make them available on the MUA website. As we approach our Nov. 11 Remembrance Day ceremonies, I have selected one story of a former McGill student from the War Records to help the McGill community reflect on war and remembrance. Frederick E. Wigle, known to family and friends as Fred, was born in Hamilton, Ont. He attended McGill where, along with 35 other classmates, he graduated in 1936 with a Bachelor of Commerce. Wigle had been a star football and hockey player at McGill and later helped coach the McGill football team. Upon graduation, he became a representative in Montreal for the Howell Lithographing Company. In 1937, he married Margaret Holton and they had a son. He had joined the 6th Hussars, part of the Canadian armoured corps, in May 1941, as an officer and was sent overseas in November. 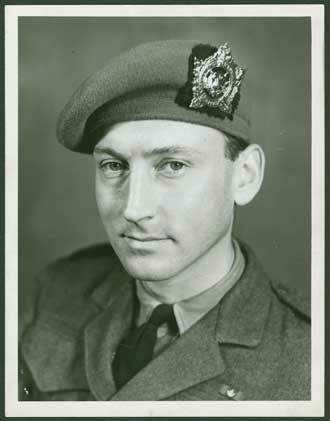 In 1945, after a series of promotions, he moved from the armoured corps to become a Lieutenant-Colonel in the Argyll and Sutherland Highlanders of Canada infantry regiment. At this point the Canadian army was advancing into German territory and fought a series of battles in the Hochwald forest. Soldiers under Wigle’s command were required to protect the Hochwald gap. The German artillery constantly shelled the battalion’s position, often disrupting communication links. During one 24-hour period, German infantry supported by Tiger tanks launched eight counterattacks that resulted in many casualties. Despite these repeated assaults the Canadian troops held their position. Wigle received the Distinguished Service Order for his actions and in the citation he was highly praised for his leadership and bravery for being constantly on the front lines with his troops to co-ordinate their defences. The regiment was to remain in the thick of heavy fighting in Germany. On April 12, Wigle set up his headquarters in a building in the town of Frieseythe. Later that day, the headquarters were surrounded and attacked by German troops. After Wigle radioed for help and secured the defences for the first floor, he was going to the second floor when he was hit by a hail of bullets fired from across the stret by a German paratrooper. He died instantly. While most of the men with Wigle were either killed or wounded, the battalion soon took back the town. Wigle’s brother-in-law, Colonel Trumble Warren, also an officer in the Canadian army, went to visit the battalion as soon as he heard about Wigle’s death. In a letter to Wigle’s brother, Warren wrote that Fred was buried with four of his men in a small makeshift cemetery, surrounded by a white picket fence, created as a memorial by his battalion. The gravesite was marked by a white wooden cross, decorated with a gold maple leaf. Warren further reported that, “Fred had won the hearts of everyone wherever he had gone. His battalion worshipped him and to every man in his battalion his death was considered a personal loss.” He died at the age of 31 on April 12, 1945, less than four weeks before the end of the Second World War in Europe. A promising life cut short by war. This is just one of the many stories documented in the War Records material kept in the McGill University Archives.